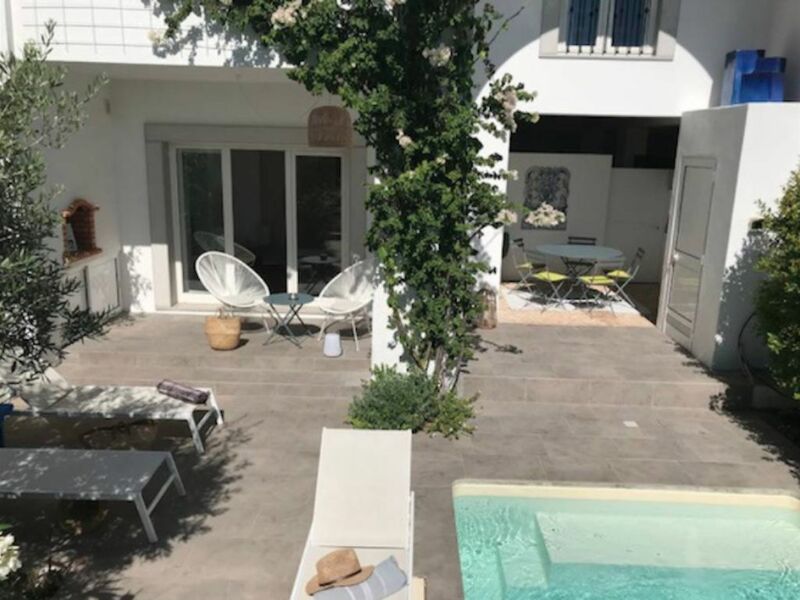 Sunny town house in the historical center of Tavira, with private garden, private pool, wifi, reverse air coditioner, fire place, inside a small condominium with a comun pool. Close to beaches and golf courses. Renovated by architect, close to beaches and golf courses. The "must" garden with its olive tree, pool and lunch place to relax. The white house, very sunny, contemporary, was built in the traditional Algarve's style. It has 2 floors, each with terrace. The ground-garden, a winter garden where 2 people may sleep, with bathroom, opens on to the garden with oliver tree and a private mini pool. On the first floor, the living room: sofa, fireplace, first terrace overlooking a large garden with orange trees, dining room, library, office, spacious fully equipped kitchen with washing machine, dryer, dishwasher, coffee machine, etc. toilet. On the second floor, two bedrooms, two bathrooms, dressing rooms, Solarium. The house is in a small secure condominium of 7 apartments and 5 private houses, all with private parking, in the center of Tavira. The condominium has a round pool with a diameter of 13.5 m plus a children's pool with accessible access. Someone will welcome you on your arrival and ensure your departure. All conveniences bakery, supermarket ... are within walking distance, as well as the pier for boat beach "Ilha de Tavira" and the river, the castle, monuments and churches. The house is within 40min to the Faro airport by taxi or rent a car. Apenas é permitido fumar nos espaços exteriores. Three of us a couple and a single stayed two weeks in the White House. A great location for walking and exploring. The house on three floors gave enough space for individual as well as group time. The kitchen was well equipped for making meals. Too bad it wasn’t quite warm enough to use the pool! Rute was very helpful especially helping us when the power went off. The balconies were wonderful places to space out and listen to the birds in the orchard. Das Stadthaus hat uns sehr gut gefallen: Es ist geräumig, geschmackvoll eingerichtet und liegt ausgesprochen zentral in Tavira. Überdies fanden wir es bei unserer Ankunft sehr sauber vor; Handtücher und Bettwäsche wurden nach der Hälfte unseres Aufenthaltes ausgewechselt. Bei einem erneuten Besuch in Tavira würden wir dieses Haus wieder mieten. We had an amazing time in this property, in fact it was one of the best we have stayed in! The house is in a very secure development a couple of minutes walk from the centre of Tavira, and less than 30min from Faro airport. The house is over 3 levels with a large lounge, well equipped kitchen and has 2 huge bedrooms with air conditioning. There are 3 bathrooms and an extra toilet. The best part for us however was the outdoor area with its own mini pool that was perfect for cooling down after baking in the sun. We wouldn't hesitate to recommend this property and will certainly be coming back at some point. The house, on three levels, was very clean and the most comfortable beds we have ever had in a rental property. We received a friendly welcome on arrival from Pedro and Rute the local co-hosts for the property. Unfortunately, the weather during our stay was unseasonably cool so were not using the lovely outside garden as often as would have liked. The garden and plunge pool are well maintained, as is the property. It is a short walk to Tavira centre with all the restaurants and shops. Thanks to Christina (owner) and Pedro for contact emails prior to the visit. Fabulous, spacious house.....well worth a stay! Had a wonderful time staying in this fabulous, spacious house. It's very centrally located and within easy walking distance to shops and restaurants in Tavira so no need for a car. Rute and Pedro met us at the house and were very helpful throughout our stay. The house was spotlessly clean and well equipped with tasteful furnishings and artwork......well worth a stay!